Disclaimer: San Remo was kind enough to send me some of their artisan pasta to try out for myself. A while back I noted that San Remo had released a range of artisan pasta. I’ve now had an opportunity to try this pasta for myself and I’m pleased to report that it is definitely a cut above the average dried pasta. Andy and I like our pasta cooked quite differently. In my opinion, he likes his pasta cooked too much, and he thinks I like it underdone. This means that dried pasta needs to be able to handle a fair bit of cooking without going soggy and claggy. And trust me – there are plenty available that do! We tried out the San Remo casarecce – short lengths of twisted pasta which hold a finer sauce really well. I was impressed before the pasta even hit the pot because the packet was easy to open without resorting to scissors or ending up with massive tears in it or pasta all over the floor. I know this sounds trivial, but the standard plastic packaging used for most food stuffs seems to defeat me. Sauce wise I made a very simple tomato based sauce. For the two of us, I finely sliced one onion and cooked that gently with a few cloves of garlic. I added two roughly chopped rashers of bacon and one (very hot!) finely chopped chilli. When the bacon was starting to look cooked, I added a tin of crushed tomatoes, a sprinkling of oregano and a splash of white wine. I let that all cook down for a while before adding a chopped red capsicum. I finished the sauce off with some beef stock that I had lying around in the fridge. The beef stock was definitely the masterstroke, as it gave the sauce a lovely depth of flavour. Given the elements of this sauce, if I hadn’t been using up what was in the fridge I would have opted for either chicken or vegetable stock. So – the sauce was excellent (of course), and easy and all done in hardly any time at all. One thing to note – when using tinned tomatoes I do find it a good idea to let the tomatoes cook for a little while. Not only does this reduce and thicken their juices but it also cooks out the slightly weird ‘raw’ taste that you sometimes get with tinned tomatoes. 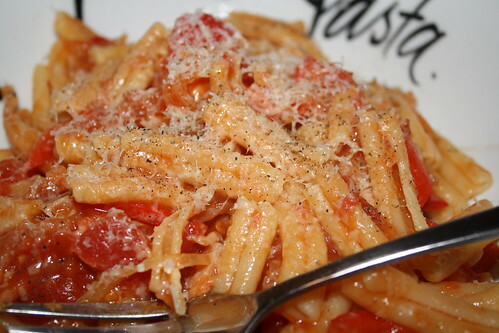 The pasta, with its twisty shape and little crevices, held on to the sauce really well. It didn’t collapse from a little extra cooking, and I felt that it still had a good bite to it. It also definitely tasted better than the average dried pasta (and also better than many ‘fresh’ pastas available). One note: San Remo clearly thinks us South Australians are big eaters! The packet says that a serving size is 125g (so four servings in a 500g packet). I used 100g per person and we still had a very generous amount of pasta left over. Unless you’re very, very hungry you might want to adjust the serving size appropriately. Of course, if you don’t, you’ll have some left over for lunch!